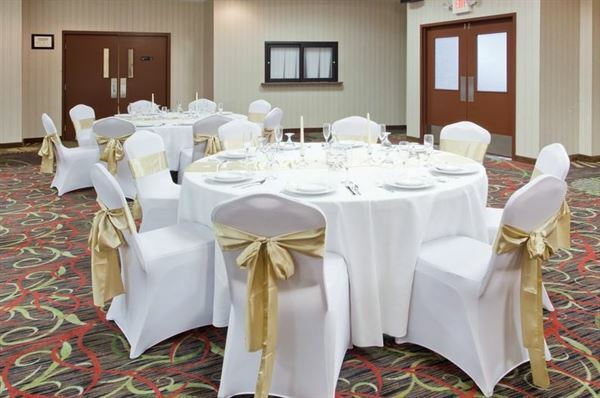 Our Dover Ballroom is 2,394 sq feet and can accommodate up to 100 guests reception style and theater style. With a built in stage, chandelier lighting, bar window, and easy access to lobby bathrooms for guests, we are perfect for graduation parties, business seminars, holiday parties, family reunions, wedding ceremonies/receptions, and birthday parties. The room rental varies based on dates. Room rental is based on a 4 hour interval. Hotel will allow 1 hour prior to start of function for client to setup. (Additional time based on availability) Outside catering is permitted for a fee up to $200. Our Wedding Reception Catering Menu caters to every budget. From our Basic Platinum Package to our Premium Gold Package and unique add-ons to include Chef Manned Stations and a 2 hour H'or D'oeuvres Reception, we are sure your special day will be everything you want it to be and more! Each package includes 12' by 12' mirror with green and frosted pebble Centerpieces on each table, white linen tablecloths and green napkins, a Decorated Head Table in front of the room for up to 8, Complimentary Accommodations for the Wedding Couple the Night of the Reception (based on availability), and Special Rates for your out-of-town Guests. All of the entrees below include: Tossed Salad, Chef’s Choice of Starch, Fresh Seasonal Vegetable, Choice of Dessert, Rolls and Butter, Iced Tea, Water, Coffee, and Decaf. Chicken Marsala Sautéed boneless breast with Marsala Sauce Roast Pork Tenderloin Sliced tender boneless pork loin served with crab béarnaise Grilled Salmon Filet Served with Dill Sauce or Pineapple Salsa Sautéed Beef Tips with Peppers and Mushrooms Chunky pieces of beef tenderloin sautéed with onions, peppers and mushrooms served on a bed of wild rice or noodles Please contact the hotel directly for current pricing and menu options. Our small multi-use boardroom is great for board meetings, bridal prep area, private cocktail area for bridesmaids and groomsmen, private brunch, or even small functions for up to 20 guests. With 2,394 sq ft of function space accented by chandelier lighting, a built in stage, and private bar area, the Grande Dover Ballroom is perfect for wedding ceremonies and receptions, birthday celebrations, holiday events, graduations, and business meetings. Our private dining area allows for a private cocktail hour for your wedding guests for up to 66 people.